A perfect latte from Ninth Street Espresso, Chelsea Market, Manhattan. The restaurant industry is not a place to do only one thing at a time. You simply can’t get away with it. This morning, I walked into a restaurant. The front room has a coffee and pastry counter, and some tables where people can eat. When I entered, there was one customer waiting and nobody behind the counter. The barista appeared and continued taking care of the other customer. She smiled weakly at me. Hi how are you? she said. Good morning, I’m good, how are you? While the barista was filling a box with pastries, the owner came and whispered something to her. She nodded and said, I got the message. We can only take cash and check, our computers are down, she told the customer. She did not look my way or try to warn me, though I could have had to wait only to be unable to make a purchase. But I overheard, and checked my wallet to make sure I had cash, which I did. The customer was contemplating how to pay. Could she come back and pay later? Could she leave her credit card number? she was asking. A couple minutes had gone by since I entered, and the barista had not yet asked me what I would like. She put a latte on the counter in a nice glass mug. She told the waitress which table it was for and looked right past me. The latte looked foamy, like a kid’s bubble bath. Blow on it lightly and you’d send foam flying through the air. A latte shouldn’t have all that foam on top, or all those air bubbles. 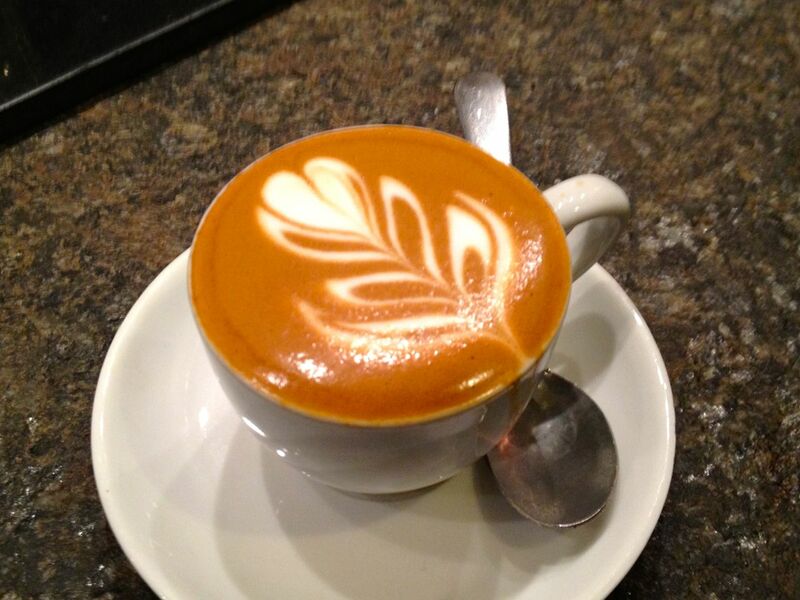 It should be glossy, flat enough to make latte-art, and the foam should be incorporated throughout the drink. All that pillowy fluff, the kind that gives you a big mustache above your lip, usually means the milk is burnt, and therefore it loses it natural sweetness and tastes bitter. I know this because I stalked my barista in Brooklyn, who started giving me some lessons. If you don’t believe me, just type “latte” into google image. Five minutes had gone by, maybe more. I started to get a little antsy. I hadn’t had any coffee or food yet. I was at risk of starvation and suffering of caffeine withdrawal!! Just kidding. But I do need to eat soon after I wake up or I get shaky. Though I could have made coffee and breakfast at home like usual, I went out for a latte because I wanted to treat myself. I went to that restaurant rather than my habitual (and good) coffee spot because the pastries are great there, and the space, the physical restaurant, is beautiful. I woke up and I thought, I’ll have a latte in a beautiful place this morning. The barista was closing the pastry box for the customer before me, and brought her a latte-to-go. I am sensing the barista will take my order any moment. And then the woman asked for a bigger latte. And, without so much as a glance my way, an “I’m sorry for the wait”, or an “I’ll be right with you,” the barista turned her back and went to the coffee machine to burn–I mean steam– more milk. She started chatting with a waitress. Standing there alone in the restaurant, I felt awkward because no one was acknowledging me. 😦 But I did not want to appear snobbish and impatient. This is Martha’s Vineyard, we are all supposed to be laid back. Not like New Yorkers. They don’t like impatient New Yorkers here. Trying to be still, and not to sigh with frustration, I suddenly remembered the latte with too much foam. Why would mine, if it ever came, be any different? I knew it would cost me five dollars at least. Like I said, it was a beautiful restaurant on Martha’s Vineyard. The barista went away again. Suddenly no one was behind the counter. So I left. I left without my latte, but also without any disappointment over money wasted on a bad latte I didn’t even want to drink. Good food and good atmosphere don’t always add up to a good experience. The good service has got to be there, too. And in a way, it’s not much different than just displaying some good manners. Am I asking for too many goods?